Looking back at the Boxcar Children series, I’m surprised at how naively I enjoyed reading the adventures of four kids solving mysteries in a bygone era, ignoring the improbable circumstances. While the stories seem much more dated and naive now, perhaps what appealed to me was reading about how the oldest sister was always somehow cooking something that sounded both foreign and yet appetizing to me, as a first-generation kid. Voila! “Rose apple tarts!” I’ve been enchanted with this idea since seeing the recipes posted earlier in the fall. 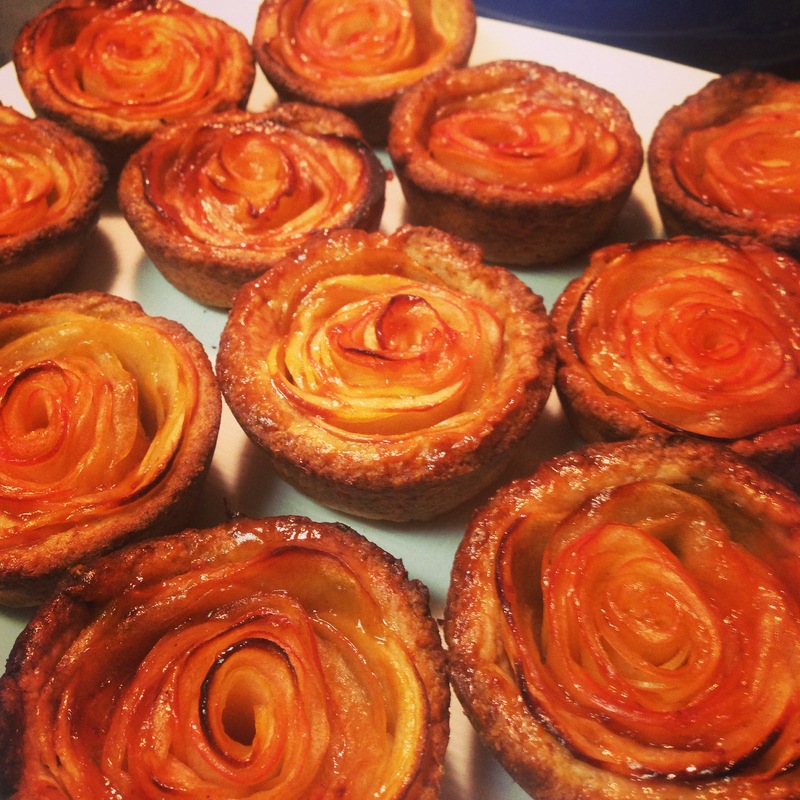 I used honey crisp apples thinly sliced with a mandolin to form the roses, and encased the “apple roses” in an almond tart crust. Blend flour, almonds, sugar and salt in processor until nuts are finely ground. (If using almond meal, pulse together dry ingredients). Knead dough briefly on work surface to combine; flatten into disk. Wrap in plastic and refrigerate until firm before rolling, at least 2 hours and up to 1 day. On a well floured surface, roll out the dough to 1/4″ thick. Use a biscuit cutter, a cup, or a bowl about 3 1/2-4″ in diameter to cut out rounds of dough. Fit each round into the cup of a buttered muffin tin, pushing the dough up the sides. Prick bottom of the dough with a fork. Chill dough while the filling is prepped. To cut the apples and remove the core, place the apple upright and make straight cuts around the core to divide the apple into four pieces: 2 large pieces and 2 smaller pieces in addition to the square core. To form the roses, place about 10 slices of apples on a flat surface, laying them out horizontally and consistently with the skin side facing you. Place each slice so it overlaps the previous slice by half. Begin tightly rolling the apples from one end to the other. Once you’ve got the basic rose shape, pick up the apples and add any additional apple “petals” around the outside, depending on how large you want the rose to be. Warm the strawberry preserves in the microwave for about 30 seconds. Brush preserves over each apple rose to glaze. * Alternatively, you can whisk together the dry ingredients and then work the butter into the flour using a pastry cutter, two knives, or your fingertips until the mixture looks like a coarse meal and there are no pieces of butter larger than the size of a pea. < Previous Welcome to my kitchen!